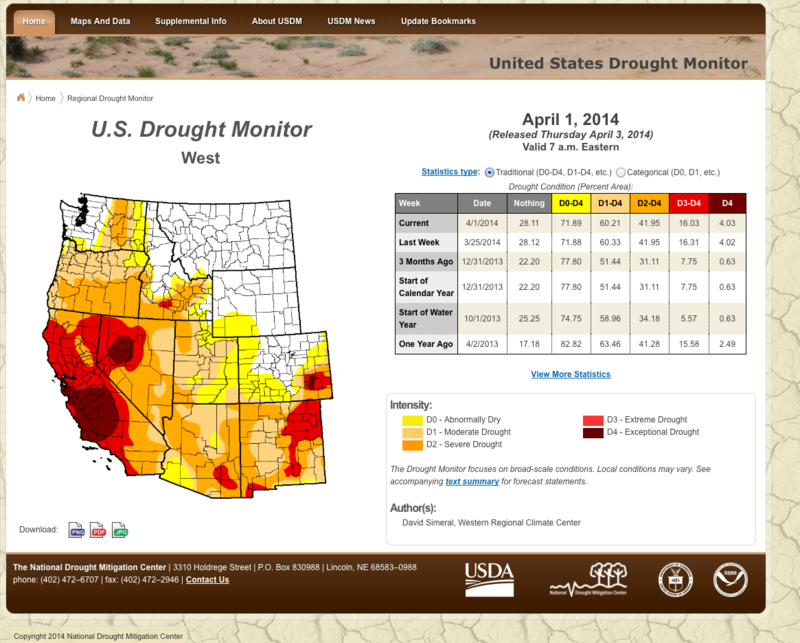 The National Drought Mitigation Center most recently shows a huge chunk of California and Nevada in “extreme” or “exceptional” drought (the latter is the worst drought condition mapped by the Drought Monitor. As of April 4, the Lake Tahoe basin snow survey shows a snowpack of 43% and the Truckee River basin just 31% of the long-term average. Presently, Lake Tahoe’s elevation is 1.2 feet or about 14.4 inches above its rim of 6,223 feet. It is more likely this year due to the low snowpack and anticipated reduced runoff that Tahoe will decline below its rim. Once Tahoe reaches its rim, no water flows into the Truckee River from the Lake. At that point, all water in the Truckee River comes from the tributaries entering the river below Lake Tahoe. While the Truckee River and rivers throughout western Nevada and most of California experience one of their all-time dry conditions, elsewhere in the west, conditions are not so severe. For example, as of April 4, the snowpack for the Colorado River above Lake Powell is 115% of average. Still, the more southerly tributaries to the Colorado do not enjoy average to above-average snowpack. It appears all-to-true that the western states continue to operate on the principal of “let’s hope for a big snow next year” to make up for the drought. But, is drought the cause of our water problems? I’m not convinced. We forget that our overuse of rivers, lakes, and groundwater makes every year a drought for fish and wildlife dependent on in-stream river flows and desert lakes and marshes at the end of the system. When will we recognize our overuse? There doesn’t seem the resolve to make changes to our everyday practices in the west to use less water. How will this year shake out for the Truckee River and Pyramid Lake? While we can’t ever predict the future, it appears that the Truckee will have pretty meager flows starting early this summer and that those flows will be significantly less going to Pyramid lake. I guess we all need to hope for a big snow next year. Right? Recent scientific work reveals a dry future? An article on global climate change in Science News (Cloudy Forecast, March 22, 2014) reports that “warming pushes [mid-latitude] storm tracks toward the poles”. Whether or not this movement of the storm track will result in a drier future for the Truckee River along with the entire desert southwest is yet to be determined. This entry was posted in Fish and Wildlife, Keep it flowing on April 7, 2014 by Dennis Ghiglieri.